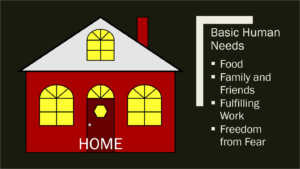 I would have to say that a house certainly fills the lowest two rungs on Maslow’s hierarchy of needs. By your definition, a home would fill higher-order needs. But that’s just the old psych major (which I dropped) coming out in me. I’m glad we try to provide homes that provide for more than just shelter. While, some of our projects reach all the way to the top of the hierarchy, we try to never forget the basic needs of people who are looking for something a little more affordable.